Dennis first connected with the Coalition on Homelessness on our bus to Housing and Homelessness advocacy day 2016 in Olympia. He then attended our first Beyond the One Night Count Advocacy 101 workshop and said it changed his life and that he was amazed by how easy advocacy could be; he came to the second workshop later that week and shared his story of calling the legislative hotline in Olympia and how easy it was to speak up for issues he cared about! 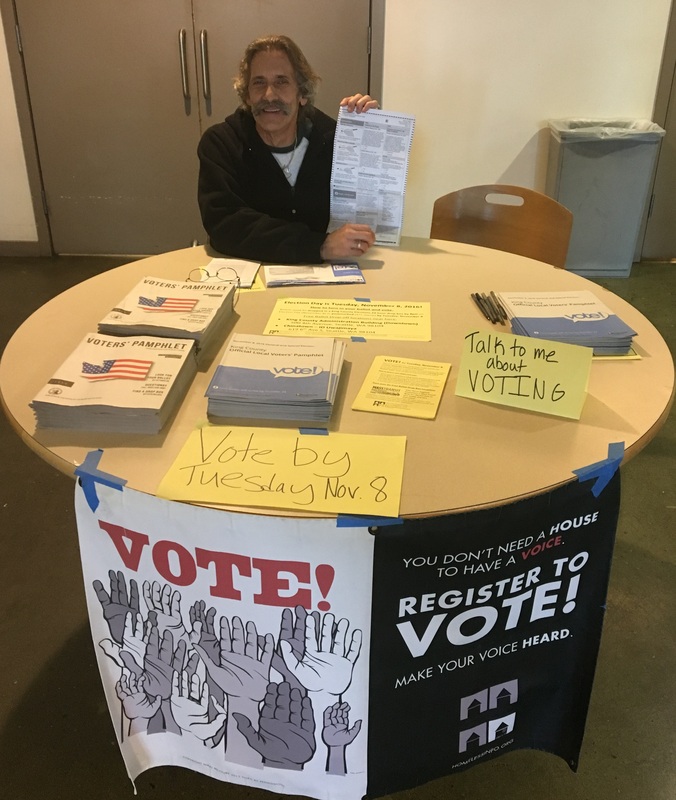 Since then, Dennis has been trained in voter registration and is an active volunteer for both Voter Registration and Project Cool. He helped us get out the vote this November to make sure people knew how to turn in their ballots, and also voted for the first time. Dennis wrote these powerful and moving words about his experience. Thank you Dennis for reminding us why we do the work we do! 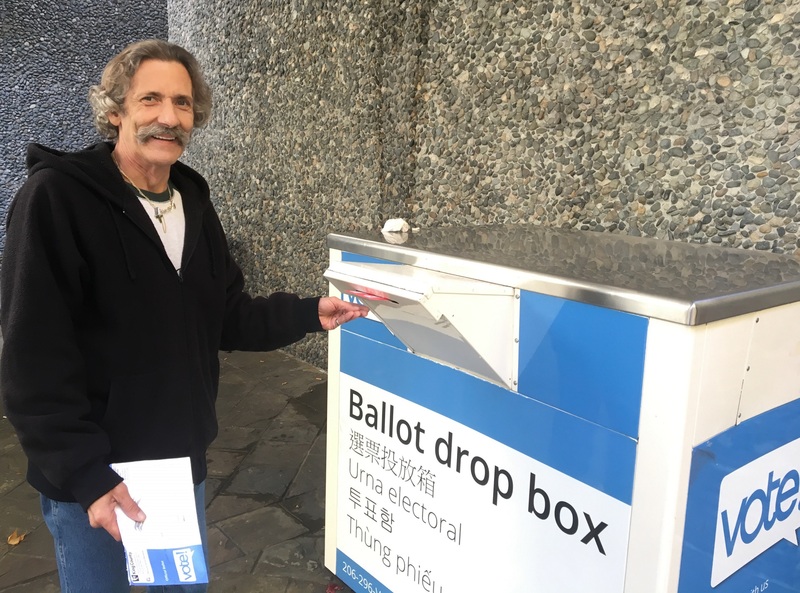 After working with Hillary Coleman this election year, learning how to register people to vote and helping them with information on where to cast their ballots and how to put the envelopes together to mail out, I finally, at the age of 63 voted for the first time. I had lost my right to vote in 1968 because of a felony, and was supervised by the department of corrections until 2012. That is a long story in itself. What I would like to share is the feeling of dropping the ballot into the ballot box today. I had this very new and strange feeling like I finally belonged to something. I felt like I was a part of society. That my vote does count, and I do have a right to vote. My self-esteem shot straight up, I felt like I had meaning and my opinion did matter. It is hard to explain because I have never felt like I was a member of society, I was always an outcast. I did not expect these feelings. I thought I would vote and no big deal. Boy was I wrong. It is a privilege and responsibility to vote in our country. Other countries do not have the right to vote. They must all feel like I use to feel. I helped a couple of other people today who had never voted. I could see the feeling of worth come over them when they sealed their ballot. Like they had always wanted to vote but just weren’t in the right place in their lives to do so. I saw the feeling of being worth something come over this one guy’s face. I felt so good seeing that and knowing that I had helped him achieve that feeling. I had not voted yet so I wasn’t really sure how that felt, but once I did vote I knew exactly how he felt.